The Flag of historical Japanese-design boat "Charase"
The plan was to sail the reconstructed boat to the Ainu Museum in Nibutani, Hokkaido, Japan. The boat was rebuilt by the shipwright who lives on the Atsumi Peninsula. 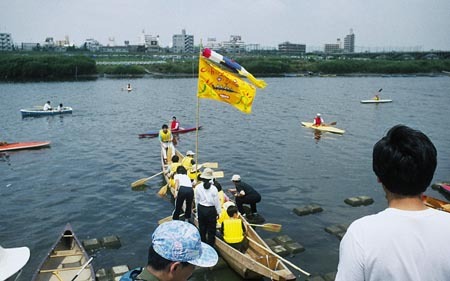 The boat's voyage went north through the Japanese River to Shigeru Kayano, the museum curator. The boat's name, "Charase" means "sliding quickly". The flag was taken on the voyage as a prayer for safety and power.